Abbas Kiarostami, the most notable auteur of contemporary Iranian cinema who passed away in July 2015 at 76, is fondly celebrated by global cinephiles for his aesthetics, visual poetry and humanistic politics. His films draw from history, sociology, anthropology, geopolitics, religion and philosophy. Masterpieces like Where is My Friend's House? (1987), Close-up (1990), and Through the Olive Trees (1994) – to name just a few -- are regarded worldwide as some of the most important works of cinema. We invite you to spend an evening viewing and discussing Kiarostami work. The director’s films necessitate keen attention because of the superb dialectics between local and global. His portrayal of a concrete (Iranian) history, culture, and politics is structured in a way that expands the experteintial horizons to the universal. It is this transformative potential of Kiarostami’s films that earned him a most notable position in the annals of cinema. For the event, we chose to show the Palme d'or winning Taste of Cherry (1997): a philosophical masterpiece and a marvelous example of film craft. A video essay that builds on sequences from Kiarostami’s films and other aspects of his versatile artistic legacy will also be screened. 17:00 – 17:10 Welcome address and introduction to the “Workshop Series on Filmmakers at St Andrews” by Prof. Dina Iordanova, Director, IGCCC. Frodon, Jean-Michel. The Kiarostami effect. Honar va cinéma n°3. Tehran. March 2016. Pp 68-75. 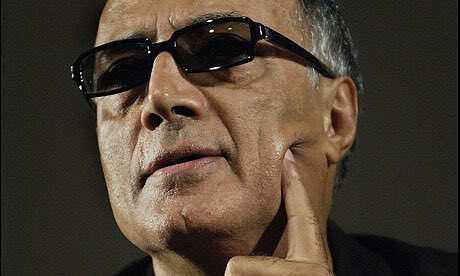 KIAROSTAMI AT ST ANDREWS is the inaugural event in a series that will see the presentation of other similar events where we will dedicate a single evening to the work of a recently deceased single personality from global cinema. Forthcoming workshops will be dedicated to WAJDA AT ST ANDREWS (March 2017) and PURI AT ST ANDREWS (April 2017). Conceived and curated by the Institute of Global Cinema and Creative Cultures (University of St Andrews) the series will celebrate the artistry of those whose names are synomymous with global film. Along with film enthusiasts who like to go beyond the mainstream, we will get together to view and discuss the work of the masters whilst their charismatic presence is still fresh on our minds. And whilst the focus will be on the films of one filmmaker, actor or other creative personality, we will invoke examples that will keep in check the context of transnational film culture, in which global cinema appears and thrives. The workshops will be lead by Professor Dina Iordanova, alongside personalities such as Prof Jean-Michel Frodon, Prof. John Burnside, and others, and involving contributions from our wonderfully global student cohort. The sessions will be loosely structured around screenings, short presentations, videos, provocations, and interventions. Everybody will have the chance to take part.